The Bank of England released its latest quarterly inflation report that shows that after a near year of temporary CPI Inflation mantra at above 3%, Mervyn King, the Bank Governor now expects CPI to spike to 3.5% during 2011 before falling back to below its 2% target and therefore implying that the real threat that the press and population should concern themselves with is DEFLATION. The Governors summary and text of the Inflation report in hindsight implies that high inflation during 2010 was obvious, however that is NOT what the Bank of England has been stating for virtually the whole year when the exact OPPOSITE was implied, which confirms my long-standing view that the Bank of England Inflation reports are nothing more than propaganda so as to enable the Bank of England to better manage the populations inflation and growth expectations by using the non existant Deflation Threat and therefore make the Banks job easier. Despite weak demand, inflation remains more than a percentage point above our 2% target. There is no shortage of explanations for the current high level of inflation. The exchange rate, on average, remains around 25% below its level in mid-2007; there have been sharp gyrations in global commodity prices and sizeable changes to VAT. It is not surprising that the combined effect of all of these factors has led to movements in inflation that are larger than those experienced in the period 1992-2007. Indeed, were it not for these factors, our inflation experience might well have been closer to that in the United States, with inflation about as far below as it is currently above our target. Given the quantitative importance of the different influences buffeting the economy at present, it is hard to judge how inflation will evolve in the medium term, and there are sizeable risks in both directions. On the one hand, slack in the economy is likely to reduce inflationary pressure. Unemployment, at almost 8%, is high, and growth in money wages has been subdued at around 2%. If the weakness in wage growth were to continue, then once the temporary effects of higher import prices and VAT wane, inflation could move substantially below the 2% target. On the other hand, inflation has been above the target for much of the 2 past three years. It is possible that additional import price pass-through or commodity price rises will push up further on inflation. And if the period of above-target outturns causes medium-term expectations to drift up, then the inflation outlook could be significantly higher. Bringing together this assessment of the uncertainties, Chart 3, on page 7 of the Report, shows the Committee's best collective judgement of the range of outcomes for CPI inflation. It is based on the assumption that Bank Rate follows a path implied by market interest rates and that the stock of purchased assets financed by the issuance of central bank reserves remains at £200 billion throughout the forecast period. Inflation is likely to remain above the 2% target throughout 2011. Over this period, the projection is higher than in August, largely reflecting higher import prices, stemming from the recent depreciation of sterling and increases in a range of commodity prices. Further ahead, CPI inflation is projected to fall back, as the effects of higher import prices and VAT diminish, and persistent economic slack continues to restrain the growth of wages and prices. At present, there are large upside and downside risks to inflation. Monetary policy has to balance these risks. Only with hindsight will it be clear which has predominated. But there is, as you would expect and should want, a vigorous debate between members, and a range of views that is wider than usual, about the weight to attach to those different risks. The MPC will continue to judge the balance of risks each month. And, like the English batsmen preparing to defend the Ashes, watching carefully and perfectly balanced in the crease ready to play forward or back according to the length of the incoming delivery, so the MPC will watch the incoming data carefully, ready to adjust policy in either direction in order to keep inflation on track to meet the 2% target in the medium term. The Bank of England's current (November 2010) Inflation Report now forecasts UK CPI Inflation to target an early 2011 peak of 3.5% before inflation falls to below 2% CPI by the end of 2011 to target a rate of about 1.6%, and for inflation to remain well below 2% into the end of 2012, therefore supporting the Bank of England's persistent view that everyone should focus on the Deflation threat and ignore high inflation during early 2011. Whilst the mainstream press laps up the latest inflation report, according to the Bank of England's forecast for UK inflation as of Feb 2010, CPI inflation by September should have fallen to about 1.4%, instead it is at 3.1% (see graph), with the forecast for inflation to fall to below 1% by the end of 2010 and magically always converge towards a sub 2% target in two years time which fails to occur 96% of the time. Clearly the Bank of England relies on the gold fish memory of the mainstream press as the BoE seeks to revise inflation forecasts every quarter to always push forward sub 2% to two years forward, which is nearly always preceded by a trend to below 2% one year forward. But as mentioned above the quarterly inflation reports are just propaganda aimed at psychologically managing the populations expectations on the economy and inflation in the direction where the BoE wants it to be as the alternative would be to make the BoE's job harder. For instance if the Bank of England stated that Inflation would be 6% during 2011 then that would ignite a wage price spiral that would make the Bank of England's job at controlling inflation significantly harder, therefore it is much more convenient for the Bank of England to be deliberately wrong in its inflation forecast than to accurately publicise probable inflation expectations. For instance if the Bank of England was not expecting high inflation during 2010 and beyond then why did the Bank of England staff pension fund switched from being 30% invested in inflation index linked government bonds to 70% during late 2009 ? UK CPI Inflation at 3.1% for September 2010 is in line with my trend forecast for 2010 as of December 2009 that projected CPI above 3% inflation for most of 2010 (27th December 2009 UK CPI Inflation Forecast 2010, Imminent and Sustained Spike Above 3%) and the Inflation Mega-trend Ebook of January 2010 (FREE DOWNLOAD) as illustrated by the below graph. As elaborated in the Inflation Mega-trend Ebook, I am expecting high inflation for many years, whilst the forecast for 2011 is pending, however there is every sign that the average inflation rate for 2011 will be higher than that which was for 2010, which again is contrary to the Bank of England's forecast for CPI 1.7%. Translating the Bank of England's Inflation Propaganda Report - If the Bank expected UK inflation to end 2010 at 1% instead it looks set to be around 3%, then the Bank of England's current expectation for UK Inflation to be at 1.6% by end of 2011 suggests that UK CPI will again be well above above 3% and quite possibly spike above 4% during 2011, with RPI significantly higher, perhaps breaking above 6%. In-depth analysis and forecast for UK inflation will follow in December, ensure you are subscribed to my always FREE NEWSLETTER to get this and all other in depth analysis and forecasts in your email in box. The Bank of England's expectations now are for the UK economy is grow by 3% for 2010 which is up from 2.2% at the start of the year. The BoE also expects growth of 3% for 2011 and 2012, which are fairly optimistic given the prospects for several years of economic austerity about to be implemented. GDP Growth for Q3 of 0.8% was inline with my forecast of December 2009 (31 Dec 2009 - UK Economy GDP Growth Forecast 2010 and 2011, The Stealth Election Boom ) that forecast Q3 growth of 0.9% which is set against Reuters poll of academic economists the day before that forecast GDP growth of 0.4%. The below graph illustrates the forecast trend for UK GDP (ABMI chain linked at market prices, change on year earlier). The UK GDP Growth trend forecast was updated following the June Emergency Budget that resulted in a revision for 2011 growth from +2.3% to +1.3% (09 Aug 2010 - UK Economy GDP Growth Forecast 2010 to 2015). Low forecast growth of between 1% and 1.5% for the next 3 years plus high inflation of between 3% and 6% (CPI / RPI), implies there is enough margin for error in the GDP price deflator utilised by the government statisticians in estimating real GDP for there to be NO REAL growth for 2011-2013, which therefore means that the UK is entering a number of years of stagflation, the experience of which will be just as painful as the Great Recession of 2008-2009 as it will be mostly hidden from public view as the government hides behind phony statistics that imply growth and prosperity when REAL INFLATION ensures they will be losing just as much wealth if not more than they did during 2008-2009!. Time for a Tea Party for Britain ? As mentioned in the June analysis (29 Jun 2010 - UK ConLib Government to Use INFLATION Stealth Tax to Erode Value of Public Debt ) the announced spending cuts will not prevent total UK debt from rising over the next 4 years by 50%. This is as a consequence of the budget deficit that will persist into the 3rd year of the cuts programme as illustrated below, which anticipates the abandonment of the cuts programme during 2013 as the Coalition government gears itself up towards generating an election boom into May 2015. Therefore the spending review did not alter Britains' path towards a debt mountain total of £1,262 billion for 2013-14, an increase of 50% on the 2009-10 total of £784 billion. The impact of a 50% increase in total debt also implies at LEAST a 50% increase in ANNUAL debt interest payments to £70 billion a year up from £34 billion for 2009-10, which also illustrates how clueless are those that argue the Coalition government is cutting too much too fast when the facts are that it is not cutting enough to have any impact on growing UK debt. Taxes - The Frankenstein coalition government is adopting far worse socialist measures that squarely targets the middle class to pay for the price for Labour's incompetence, far worse than that which the labour government had planned to do by effectively taxing the middle class to at least 70% of their earnings (40% Income Tax + 12% NI Tax + 17.5% VAT + 4.6% RPI Inflation (inflation is a stealth tax that the population has been conditioned to view as beneficial when it is actually an earnings and savings purchasing power destroyer) ). Government Spending - The policies announced to date pay lip service to spending cuts on an out of control welfare state with the largest budgets that deliver no output for additional resources such as the NHS being ring fenced for growth. The consequences of this is that government spending will NOT be cut and instead continue to increase every year from £680 billion for 2009-10 to at least £739 billion for 2014-15. Therefore the coalition government has FAILED to implement ANY meaningful cuts in what remains as out of control Government spending. Tuition Fees - The coalitions policy on tuition fees illustrates a government that is anti-education and destroying the ability for the country to generate future wealth. 1. Tuition Fees will rise from £3,300 to £9,000, saddling graduates with an estimated average debt of £40,000 with all of the consequences both psychological and financial in terms of credit ratings where the debt will impact on graduates for the next 30 years of their working lives. 2. That the debt interest will be at Inflation (RPI) Plus 3% (7.6%), against the current student loan interest rate of 1.5%. 3. Those that pay off their loans off early will be punished, and unpaid debt will be wiped out after 30 years. 4. Repayments will kick in for those earning at £21,000 rather than £15,000, which effectively punishes those that are more productive and acts as a disincentive to work harder, and every year workers delay working harder for higher pay means loss of potential tax revenue, which suggests that the Government is grossly over optimistic in what it expects these workers will earn in the future which is based on growth in graduate pay of the past 30 years when there were far fewer graduates who were NOT saddled and disincentivised to work with £40k of debt repayments. Which also means that perhaps as much as 50% of the monies loaned will never be repaid. The overall effect is to make university education less palatable to all sections of the population as all will feel the financial and psychological pressure of being saddled with £40k of debt as soon as they leave University and get their first job, especially as the high interest rate ensures that the debt total will continue to soar. Key to the countries future is always in the quality of those that enter the Labour force, therefore education should be free so as to maximise the educated worker population pool that will maximise the higher tax payer base, after all middle class tax payers are taxed at an extortionately high rate of approx 70%. The Coalition (as did Labour) have let off hook those who are responsible for the financial crisis i.e. the banking sector with the Bank of England at its head. Many mistakenly jump to the conclusion that capitalism was to blame for the financial crisis. However it was not capitalism to blame but socialism, because if there was any doubt in anyone's mind that the banking system that operates in all of the western countries is socialist, then the bailout and protection of the bankster's and their bonuses should have put that to rest. The power to print electronic money is delegated from the central bank by means of fractional reserve banking which creates the booms and boosts between alternating trends of out of control credit creation followed by credit destruction. However what Mervyn King will never acknowledge is the fact that the Bank of England is THE PRIMARY REASON why the banking crisis occurred, because it lies at the heart of Britains fractional reserve banking system that allows bankster's to bank bonuses on the basis of fictitious profits and then dump the losses onto tax payers i.e. profits are privatised whilst the losses are nationalised. The Bank of England will never allow real radical reforms to end the socialist banking system because that would result in an end to fractional reserve banking, and if there is no more fractional reserve banking then there is no need for the Bank of England to exist. Therefore Mervyn King is talking a load of nonsense that he does not even agree with as the Bank of England aims are to grab more power from Parliament so that more money can be fraudulently funneled into the hands of a few thousand bankster's that Mervyn King is literally the King of! If the UK government were not in the back pockets of the Bankster elite then they would be taking powers away from the Bank of England instead of handing over more powers to the Bank to print money and inflate the wealth and purchasing power away of hard working citizens that have increasingly been turned into debt slaves, families now work twice as hard as they did 20 years ago with less purchasing power as a consequence of the theft of purchasing power by means of continuous money printing / credit creation (electronically) via the factional reserve banking system that continues to destroy the value of the currency in real terms as the above British Pound graph illustrates. The only way to stabilise the value of money and prevent a future banking crisis (which is guaranteed) is to end fractional reserve banking so that Banks can only loan out what they have received in deposits. Instead our current fraudulent banking system exists where the Bank of England prints money that is loaned out on leverage to the bankrupt banks so that they can go and buy government bonds on even more leverage, resulting in huge profit margins for near zero risk. The Banks then treat these government bond holdings as assets against which they can create many multiple of times of electronic money in the accounts of borrowers, loaned out at exuberant interest rates in many cases X20 the rate of the base interest rate that Banks can borrow at from the Bank of England. The system is designed to generate literally unlimited profits for the bankster elite, and if the banks lend too much then the socialist banking system ensures that the ordinary tax payers will be forced to step in and bail out the banks at any cost and ensure that all bond holders are protected at 100%. This is NOT capitalism, this is socialism. Capitalism is a mechanism for the allocation of capital towards whichever business is profitable, and as long as the business is profitable the business is financed, if the business stops being profitable then capital is reallocated to other ventures that could prove profitable. Capitalism is not conjuring money out of thin air that is loaned out to ANY business whether it is viable or not amidst a credit boom (as there is unlimited money), and then when the bubble bursts have tax payers step in and cover ALL of the banking sectors losses after bank officers have banked bonuses on fictitious profits, leaving hollow husks behind for the tax payers to cover the liabilities of. That is not capitalism, this is fraud on the tax payers of Britain, far greater than any mafia don could ever hope to achieve. Interest rates are near ZERO so as to allow the bankrupt banks to maximise the amount of profits they can make as they borrow at 0.5% and then leverage it up by the fractional reserve banking system to between X10 and X20 then go on and buy government bonds at 3% which implies an instant profit 25% to 50% all courtesy of the Bank of England and Tax payers. In America the tea party movement is rising up against the blatant frauds that are taking place such as Hank Paulson the ex CEO of Goldman Sachs effectively engineering a £700 billion theft from taxpayers to the bankster's. Isn't it time for the middle class of Britain to also wake up to the fraud of the socialist fractional reserve banking system that seeks to destroy the value of a life time of savings ? David Cameron's coalition government is not showing any vision, instead it is magnifying the policies that the Labour government had planned to implement and even more eager to protect the Bankster Elite that many Conservative MP's hope to join on leaving office. So Britain does appear ripe for a Middle Class led Tea partyesk movement across Britain to cut taxes from 70% and out of control government spending and destroy the power of the bankster elite that the country remains firmly in the grips of. Ireland's economic depression is intensifying as the economy remains in recession and Irish bonds plunged sending yields soaring on concerns of more banking sector losses that continue to send Irelands public debt and liabilities soaring as the bankrupt banks continue offload their huge losses onto Irish tax payers, that negates all of the austerity pain suffered to date, which requires even more sacrifice to ensure that the bankster's and bond holders are bailed out 100%, resulting in an country bankrupting annual budget deficit of 32%, which Ireland cannot monetize through money printing. The irish government is desperate to follow the lead of the UK and USA by printing its way out of its debt crisis, but it cannot do so because it remains firmly anchored along with the other bankrupting PIIGS within the Euro currency zone so money cannot be printed and their currencies cannot be competitively devalued against the might of the German Industrial Empire that holds the rest of the Euro-zone as a captured market for its goods and services. The people of Ireland having endured over a year of austerity on the promise that it was all necessary to suffer pain today by cutting public spending so as to reduce the annual budget deficit to sustainable level for economic gains tomorrow. Instead the exact opposite is taking place as the Irish economy contracts due to economic austerity whilst its bankrupt banks are sending the countries debt and liabilities soaring, thus resulting in a far worse budgetary position than where Ireland was before the austerity measures were implemented as the bond markets are waking up to evitable debt default which is sending interest rates demanded to hold Irish debt soaring to new credit crisis highs. An exhausted Irish Government devoid of any new workable solutions to the spiraling debt crisis, unable to print money and inflate their way out of debt are instead announcing policies the likes of Quantitative Cheesing, which literally boils down to handing out parcels of cheese from the European Unions Cheese Mountain to Irish families to consume or trade as opposed to handing out money which they are unable to do. This is no joke, as a 55 ton handout of E.U. cheese is heading for Irish towns and cities, which does not exactly send a message of confidence to the financial markets as to the state of the Irish economy. Whilst the mainstream press these past two months has been obsessed with the Greek debt crisis, the above graph clearly illustrates that a far larger debt crisis looms in Ireland that could soon transplant Greece in the debt crisis headlines over the coming months, similarly a number of other Euro Zone countries head the risk towards bankruptcy league table with Belgium and Portugal not far behind Greece. The price that these countries pay for being stuck in the Euro single currency is that they cannot devalue to try and gain some competitive advantage for their economies and therefore try and grow and inflate their way out of a high debt burden that stifles economic activity. However they also benefit from the fact that had they not been in the Euro then many of these countries would also be where Iceland is today as they would no longer be able to service the debt denominated in foreign currencies as their own currencies would have crashed as investors rush to the exit to preserve as much of the purchasing power of their investments into alternative currencies. The consequence of this in ability to devalue is deflationary as the economies contract in an attempt to reduce the debt burden and budget deficit as they attempt to move to a new sustainable equilibrium within the Euro block that demand greater competitiveness by means of reduction in costs i.e. by deflating wages, failure to do this results in higher interest rates and therefore a greater debt interest burden which again risks default. As the above illustrates, Greece was and remains just the tip of the Eurozone debt ice-berg as countries such Ireland, Belgium, Portugal and Spain were destined to line up for a Euro-zone (German) bailout. All of the Eurozone PIIGS have since accelerated along the debt deflation path, feeding the economic crisis in Ireland as they cannot print money and devalue as the PIIGS are locked into the Euro which benefits the industrial countries such as Germany that profit from the Eurozone both in terms of a captured internal market that cannot compete against German industry, and exports to outside the Eurozone where the Euro is kept weaker as a consequence of the PIIGS thus enabling Germany to profit from a huge trade surplus. Ireland Debt Crisis Solutions ? The same trend continues as I wrote of in April 2010, which requires the same solution of the Eurozone splitting into two or more currency blocks so as to enable competitive currency devaluations to take place, the alternative is for all of the Eurozone trade surplus countries to hand over a large chunk of their annual surpluses to the PIIGS in order to reduce their annual budget deficits to a manageable % level inline with the E.U. average. Neither of these solutions is perfect as ejecting the PIIGS from the Euro would send their currencies sharply lower and inflation soaring as they try to inflate their way out of their debt crisis (as the UK is doing). However the problem here is, as I have identified several times before that most of the debt of the Eurozone PIIGS is denominated in Euro's, which means that a devaluation would increase the value of the debt in the new currencies. Again, when you view these forecast graphs note that you are viewing the relative rate of free fall between currencies at a particular point in time, as ALL currencies are continuously in free fall which results in the loss of real purchasing power of all currencies of which the official inflation statistics are one measurement. 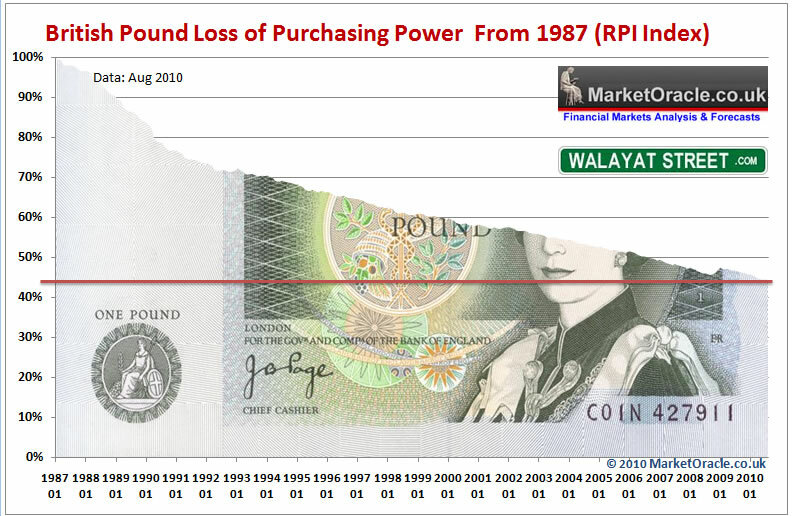 For example the British Pound in exchange rate terms is roughly where it was against the U.S. Dollar 20 years ago, however sterling has lost over 40% of its purchasing power on the RPI inflation measure over the past 20 years. Ultimately all governments are heading towards the same final destination of debt default bankruptcy, the only question mark is will it be outright debt default or stealth default by inflation. Where countries such as Ireland and Greece are concerned then they are currently more probably heading for outright default. Countries such as the UK and USA are DEFINETLTLLY heading along the path of stealth default by means of inflation as engineered by governments which is usually the more probable route as outright debt defaults tend to culminate in extreme crisis events associated with economic collapse (29 Jun 2010 - UK ConLib Government to Use INFLATION Stealth Tax to Erode Value of Public Debt). Bottom Line: Where Ireland is concerned, the E.U. will do its best to delay the inevitable debt default, which means a Eurozone bailout (one of a series) is imminent, because if one of the PIIGS defaults then so will they all which would require the mentioned Euro 2 trillion QE bailout virtually immediately (a Euro 750 billion bailout fund was announced in May), rather than perhaps Euros 80 billion for Ireland on its own at this stage of the crisis, and after Ireland will soon follow Portugal, then Spain, then Italy before the bailout cycle returns once more for another Greece bailout (probably sooner rather than later). All of which feed the Inflation mega-trend across the Euro-zone. The stock market trended inline with expectations for a break below 11,380 to target a down trend to at least 11,200. (08 Nov 2010 - Fed Inflationary Money Printing Propels Stocks 'Stealth' Bull Market to New High ) The Dow entered the downtrend form early week into Friday's 11,192 close, for a relatively mild correction of some 250 points to date. During the past few weeks stock market sentiment appears to have become overly bullish as evidenced by the internet littered by those that were bears when the stock market was over a thousand points lower who are now bullish AFTER the stock market has put in a sizeable rally. Even more worry some are tend patterns and expectations that are resolving towards a minor correction now for a rally into the end of the year to target 12,000+, which is the trend pattern I have had in place for the Stock Market since January 2010's Inflation Mega-Trend Ebook (FREE DOWNLOAD) and (02 Feb 2010 - Stocks Stealth Bull Market Trend Forecast For 2010). More recently updated forecast graph (18 Oct 2010 - Stocks Stealth Bull Market Dow Trend Forecast into Jan 2011). The question I am asking myself is should I ignore the prevailing bullish consensus ? After all the consensus is NOT always wrong, especially if this stealth bull market is entering a stage where 'stealth' should now be dropped in favour of a bull market proper. Off course the next big correction will once more convince the perma bears that the great bear market or worse a crash is once more imminent. The recent correction is relatively mild, the actual peak came in a little later and higher than anticipated which on face value suggests a higher target low for the correction i.e. in the region of 10,900 to 11,000 rather than 10,500 to 10,700. So the Dow could be about half way along what looks like turning out to be a relatively mild correction of 4%-5%. 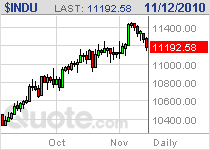 Therefore the Dow targets a continuing downtrend to 10,950 this coming week. 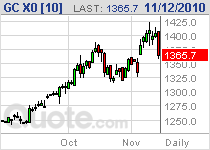 Gold managed to push to a new all time high of $1425 before peaking out and plunging on Friday to close at $1365. Silver's strong rally continued early week by breaching $29 to peak at $29.33 before tumbling all the way to close at $26.06. Last weeks analysis specifically warned Silver investors to keep a very close eye on the market and be prepared to bank profits, as it was highly probable that all of the run up form $22 could evaporate quite quickly. SILVER IS VERY VOLATILE and could easily retrace ALL the way back to about $22, so I am eyeing to bank profits and not get blinded by the uber bullish silver sentiment that is now emerging as for instance a drop from about $29 to $22 would be a huge 33%! Remember there is no such thing as a missed move as the market is always there, and the number one aim of trading and investing is to bank profits. Friday's Gold and Silver plunge implies there's more to come, which suggests that Gold targets support at $1300 and Silver at $22.50 (-33%!). In summary, courtesy of Ireland and the other PIIGS, stocks, gold and silver are firmly back to being inversely correlated to the U.S. Dollar, and as the dollar is expected to rally, then these markets (and other commodities) are following the script for a decline, the degree to which depends on how high will the dollar spike (my trend target is USD 80). 17 Nov 10, 12:42 Thoughts on SSE? Love your material, and have been recommending it to my peers. Any thoughts on the direction of the Shanghai Index? I've been investing in the China space and the SSE is down 14% in the past week due to rate hike fears. Would you suggest any time scale for Dollar rally. 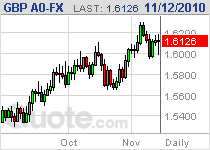 The dollar rally a corrective, which I am viewing as an opportinity to offload more dollars on. My original expectations are for 80 by early Dec. It may get there earlier, but volatility is high and without an actual crystal ball, it could range to between 79-81 before peaking out. 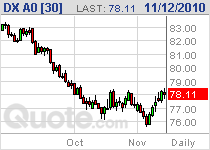 Ulimately the USD targets 69-70 by mid 2011.